TONETS Corporation has established a new method to streamline their equipment replacement/installation work. 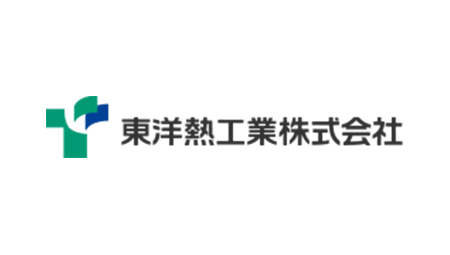 TONETS deploys 3D scanners, InfiPoints for preprocessing of obtained point cloud data, and BIM (Building Information Modeling) software for working drawing creation. In comparison to the conventional method—create drawings manually based on the on-site physical measurements —, the lead time for BIM model creation has been reduced by 50 percent, and they achieved to provide more efficient and better quality service. TONETS Corporation designs, installs, and maintains the heating, ventilating, and air conditioning systems. 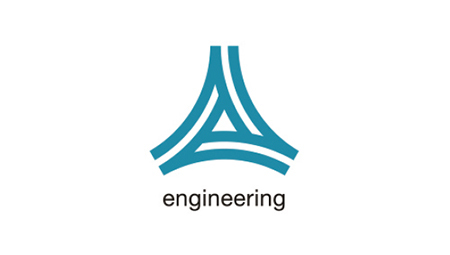 For the replacement or new installation of the equipment, they create working drawings from the scratch based on the on-site physical measurements because the drawings do not exist in most cases, and even when drawings are available, they are not accurate or do not match the actual state after years. On-site physical measurement is time-and-cost consuming because it requires scaffolds to measure the high places or unreachable areas, and in many cases, they even visit the customer site again to complement the missing information. They launched a project to save the labor and streamline the process to prepare the working drawing. It directly leads to the overall time reduction of replacement/installation work to improve the process to prepare the working drawings, and they started off with introducing the 3D laser scanner in combination with BIM software to establish a new method. The advantage of the 3D scanning is the accuracy of the obtained data, which can be utilized for drawing creation in BIM software. However, an issue emerged soon after — it is essential to have a tool to generate CAD models from obtained point cloud data, otherwise, they would still have to create drawings from the scratch. 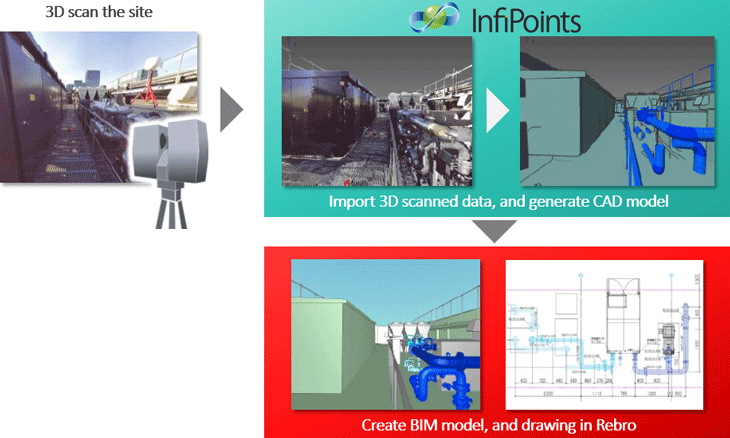 TONETS introduced InfiPoints, software to handle huge point cloud data with high performance, measure distances and angles accurately in the virtual environment, and extract planer/cylindrical shapes from point clouds and generate CAD models. They achieved to save the considerable amount of time-consuming manual work and reduced the lead time by 50 percent for drawing creation while maintaining, or even improving the quality of output drawings by a new workflow utilizing the CAD modeling functionality of InfiPoints — import 3D scanned point cloud data to InfiPoints, and automatically generate CAD models for equipment and piping systems, then, import the generated CAD model to Rebro, BIM software developed by NYK Systems, and create a BIM model by modifying the imported CAD model. Moreover, TONETS also utilizes 3D simulation functionality of InfiPoints — conduct simulation of carry-in/out routes, preview the state after the installation, and more. This dramatically improves the work efficiency because they can share and clarify the work plan in advance. TONETS continues to work on process improvement and plans to streamline the replacement/installation of building equipment by utilizing InfiPoints.